ECE ILLINOIS alumnus Saiprasad Ravishankar (PhD ‘14, MSEE ‘10) and ECE Illinois professor Yoram Bresler's paper “Learning Sparsifying Transforms,” which was published in IEEE Transactions on Signal Processing, has won the IEEE Signal Processing Society Young Author Best Paper Award for 2016. The award was presented on March 6 at the beginning of the IEEE International Conference on Acoustics, Speech, and Signal Processing (ICASSP 2017) in New Orleans. Ravishankar began to work on the research that is entailed in the paper around the summer of 2011. The paper was accepted for publication in September in 2012. Ravishankar and Prof. Bresler, his advisor and co-author, met for long hours during his PhD to discuss research problems and work on them. “He set high standards for research early on, which helped me grow intellectually.” noted Ravishankar. The paper focuses on sparsifying transforms which are commonly used in signal processing. It proposes ways to learn such transforms from data and shows that these “learned transforms” capture the underlying structure of natural signals and images effectively. The data-driven transforms outperform conventionally used mathematical models in their ability to sparsify images. Moreover, the transform learning methods proposed in the paper involve simple mathematical operations such as vector thresholding and are more efficient than previously proposed methods for learning dictionary models. Ravishankar considers the paper to be the opening act of his research in the new field of transform learning. He has since worked on research that significantly extends the ideas presented in this paper. Transform learning-based methods have been shown to provide high quality results in many imaging and signal, image, and video processing applications. The award has also provided Ravishankar recognition among his peers for his research. Ravishankar came to Illinois after graduating from the Indian Institute of Technology (IIT), Madras. At Illinois, Ravishankar completed his master's degree and PhD in electrical engineering. He was also a postdoctoral research associate with Prof. Bresler. In spring 2015, Ravishankar taught ECE 310 and ECE 311 (Digital Signal Processing). His interactions with Illinois students through teaching and mentoring nurtured a strong interest in an academic career. 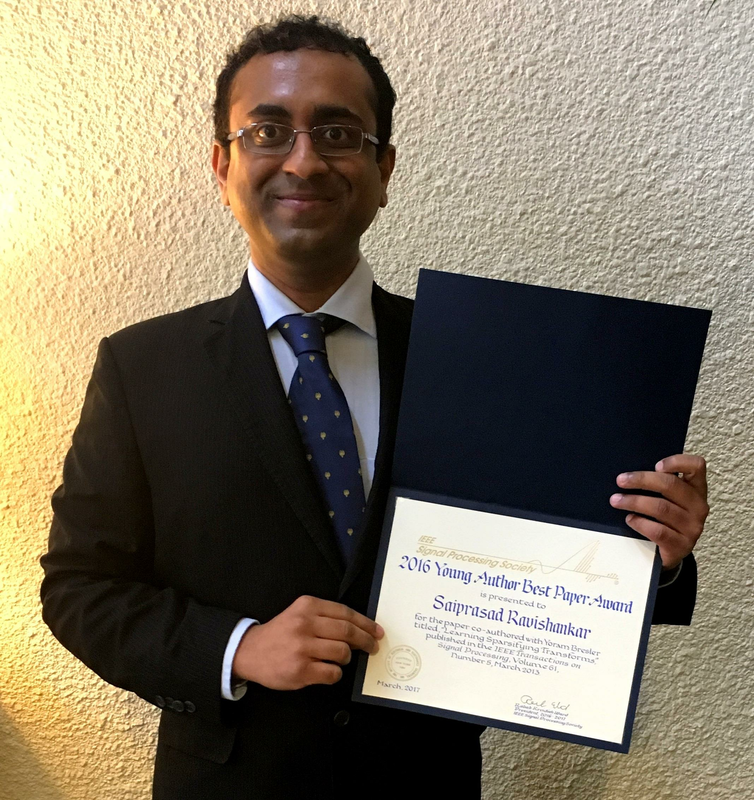 Saiprasad Ravishankar wins IEEE Signal Processing Society Young Author Best Paper Award for 2016. Ravishankar acknowledges Prof. Bresler’s commitment to research and hard work a source of constant inspiration. “His passion for research, his ever hard-working style and his dedication to his students have been an inspiration to me.” said Ravishankar. He also cited the guidance and support from Illinois faculty and his doctoral committee members. Ravishankar is currently a research fellow in the electrical engineering and computer science (EECS) department at the University of Michigan. His research interests include signal and image processing, data modeling, biomedical and computational imaging, compressed sensing, inverse problems, machine learning, and large-scale data processing. The paper by Ravishankar and Prof. Bresler can be found at http://transformlearning.csl.illinois.edu/publications/.